A light airplane has landed on a highway in the Moscow region because of engine failure. 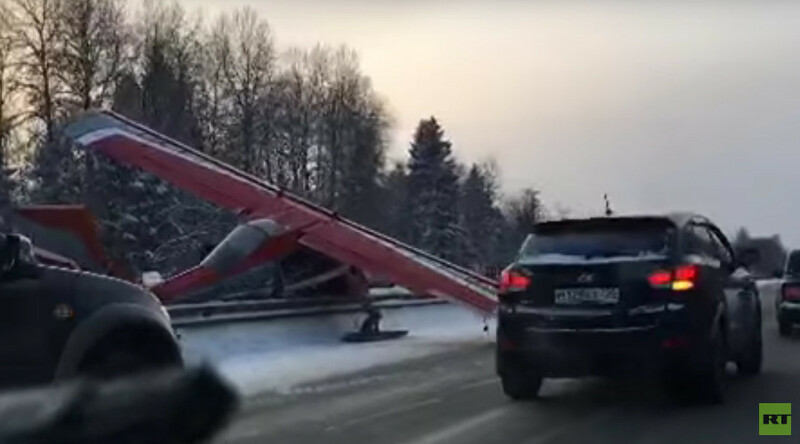 The unusual incident happened on Yaroslavsky Highway outside Moscow, where a two-seat light airplane landed amid traffic. The pilot, who is said to have been on a training flight, managed to land the plane on the strip carefully, without damaging any vehicles. Nobody was injured in the incident including the pilot himself. Traffic was not disrupted. The Investigative Committee is now looking into the landing which sent shockwaves across public circles. “You must be a thick idiot to fly a light airplane under such weather conditions! That is a pure luck that nobody was injured in the incident. I wonder if this flight was really necessary,” senator Franz Klintsevich said as cited by RIA Novosti. On Saturday it was a windy and snowy weather in the Moscow region with the temperature standing at 14 degrees Celcius below zero. In August eight people died after a light plane smashed into a helicopter over the Istra Reservoir, Moscow region.